Home > The Blog > Email Marketing > Plain Text Email vs. Visual Email. Which One Should You Be Using? What people say they want and how they actually behave are two very different things. That’s why understanding more about how people react to plain text email vs. visual email is important. You’d assume that people want visual everything and respond better to visuals. We’re wired for visuals, aren’t we? In the case of emails, you would be wrong in many cases. But not all. Of course, there are a lot of variables and I always have to mention this. The world is never black and white. There are all shades of gray in the world and of course, it’s worth calling out. Some emails are expected to be visual and should not be any other way. For email marketing in many industries, visuals should be shunned unless they have a direct importance to the email topic. When it comes to email, less is more. The more visuals and HTML used in an email the lower the open rate. But do proper testing because every industry is different. Now it’s time to look at some of the details and where I’m drawing this all from. Some of what I talk about is from research conducted for the most part by HubSpot. You can learn more about their research and their write-up on plain text vs. HTML blog post. 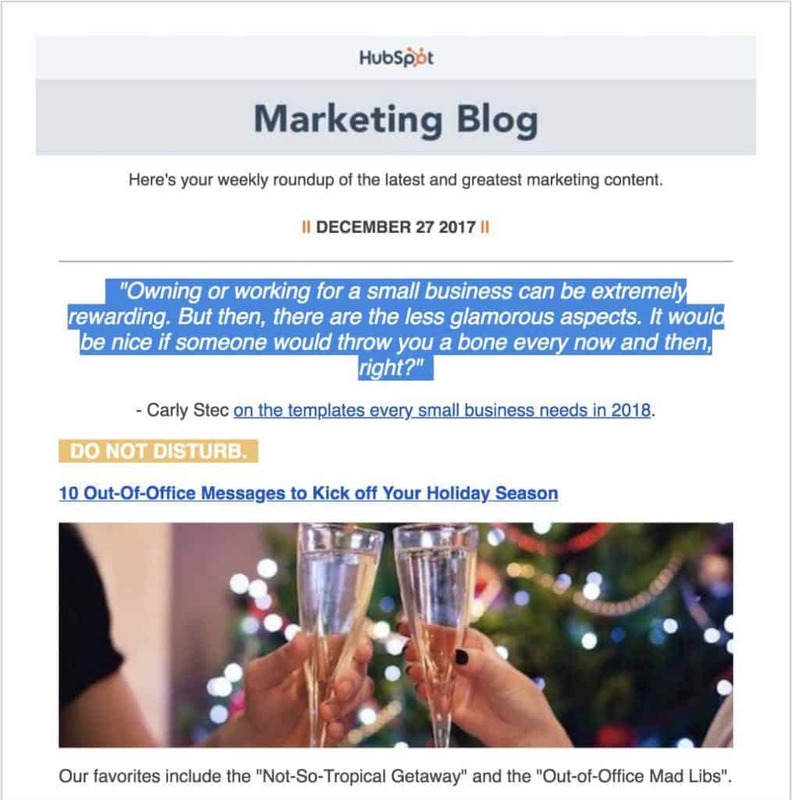 Not all of the information comes from HubSpot though. Some is from experience working with different types of email newsletters (not a lot of hard data there though) and some is from what I’ve observed from other marketers experiences. Just like you can’t take people’s word for it on what they want, you also can’t only take only data and call it good. There’s more to it than that. There’s more you have to take into account. Listen to what people say but don’t let it run your email marketing OR your whole business. While one person might not like one thing, another might love it. If you keep chasing making everyone happy then you’ll make no one happy. So, do people want to receive email that is mostly plain-text or would they rather have heavy HTML and visual emails? 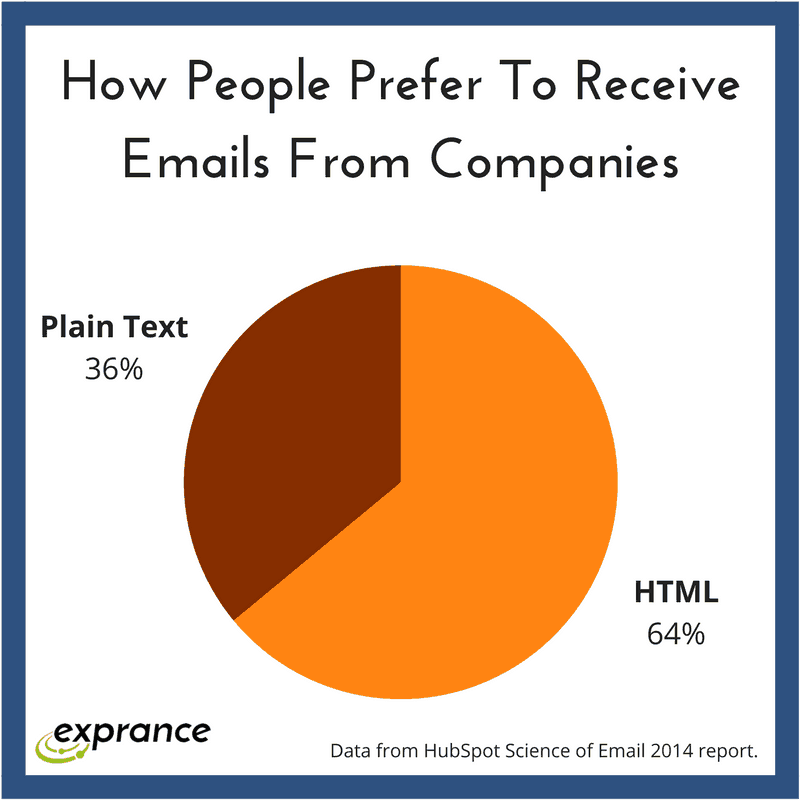 According to the HubSpot research, everyone wants the more HTML heavy visual emails. Yes, if we take people’s word then text email vs. visual email would always end up with visual email winning. Makes sense right? Who wants to read a bunch of text when visuals can represent things in an easier way? I would probably also respond the same way. I like more visuals and I prefer to skim and get my information quicker from email. Well, it doesn’t really work that way in the real world. What people say they want and actually behave is very different. That could be because of technical functions of email clients or it could have to do with the users themselves. More likely it’s a mix of the two. Getting to know what your audience wants is more difficult than just asking. Of course, you always want to ask and use that as a starting point for what you deliver. That shouldn’t be it though. Apple is one of the worlds largest companies not because they give people what they want. No, Apple grew so large and amassed so much wealth because they gave people what they didn’t know they wanted or needed and then perfected it. I’m sure they did some research and take feedback from their users to heart. They don’t let their customers run the whole show though. There should be more research that goes into product and service development than just user feedback. And of course, the A/B tests that HubSpot ran reveal that in every case images in an email reduce open rates. A .GIF can reduce the open rate by 37%. A fancy HTLM template can reduce the open rate by 25%. More HTML can mean open rates lowered by 23%. Their blog post gives you a nice comparison visual of each email they tested. That means giving people what they are actually asking for can hurt you. How is this even possible? There is a big difference between preference and what happens in reality. Why the difference in preference vs action? It seems it all comes down to how people prefer images and HTML heavy emails. It also comes down to how SPAM works. Visuals perform better for a lot of things but an inbox is a touchy place. There are some negative feelings associated with overly visual emails in our inbox. Sometimes it looks too much like SPAM or it looks too much like a promotion. Text, on the other hand, is typically how people use email to communicate. When you email a coworker or a friend then it’s just a bunch of text. No fancy templates, no pictures. Replicating the more personal feel of a text-only email has many benefits for companies. A company email is more likely to be seen as communicative rather than SPAM if it’s short, to the point, and above all else, text. When a marketing email arrives in an inbox it’s no longer personal. That can be jarring to a person who has expectations. Your company isn’t being attached to a very good feeling if your emails are too starkly different than their friend’s emails. Email providers have reacted appropriately to the need to manage these emails too. This is probably what has led to a reduced open rate in emails that look promotional. Lots of HTML and visuals look very promotional in many cases. Gmail dumps promotional emails into a special (and sometimes forgotten) tab. Guess where HTML rich emails with lots of pictures are more likely to go? They are dropped right into the promotions folder which sometimes gets forgotten or clean swept. It’s not always possible to skip the promotions folder though. So when it comes to text email vs. visual email, which one is better? Is Text Email Better or Visual Email? It may seem like all the research and behavior says that text email is the way to go in all cases. As I stated in the beginning though, the world isn’t black and white, there are lots of grey areas. Sometimes it’s absolutely necessary to send a more visual email (if it’s well formatted). I imagine a text-only email from Macy’s wouldn’t perform too well. Even HubSpot who did this research doesn’t completely stick to their advice in all cases. The email looks nice and does its job but it’s definitely heavy on HTML and visuals. I also have clients who I manage their email marketing campaigns and their open rate is extremely high at 30 to sometimes up to over 40% (that’s great for a retail email!). Open rates sometimes correspond to industry and a specific audience more than it does anything else. Emails that are sent to consumers might need to be visual heavy whereas a business it should be more text. eCommerce is often visual if you’re selling a physical product. In that case, visual email is most likely to perform better overall. You have to look at more than just open rates. Do recipients also take action on your call to action? Any high-quality email tool will give you the ability to A/B test your emails and I encourage you to do so. Successful marketing is all about thorough testing. Not only is testing important but continuing to test is even more important. Don’t think you can do one test and find your best. It’s all about constantly testing in order to find out the best opportunities. From emails to landing pages, testing will ensure you’re always heading down the right path. It’s a long path though and there are tons of branches. Testing helps you pick the right one though. Always test your email, landing pages, and more to improve your digital marketing success. There are only two things you have to remember in marketing to be successful. Everything else is in addition to these two things and won’t have as big of an effect on your overall strategy. The good stuff can always relate back to one of these two tasks. Much of this applies to sending newsletters but you should also be testing emails you send to individuals. You can track email opens just the same to test subjects and the body of your messages to increase your response rate.